Incoming European Union Ambassador to Zimbabwe Timo Olkkonen presents his credentials to President Emmerson Mnangagwa at State House in Harare. ZIMBABWE's facing one of its most defining moments and the European Union (EU) is ready to help the Southern African country reclaim its "rightful" place in the region, Brussels' new representative in Harare has said. 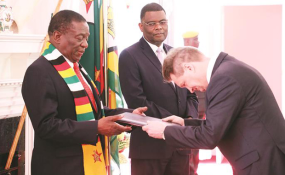 Ambassador Timo Olkkonen who presented his credentials to President Emmerson Mnangagwa Thursday said he wants to see the implementation of political and economic reforms in the country. The EU is one of a few groups whose Observation Missions to the July 30 elections were critical of how the polls were run and came short of declaring them 'not free and fair" but peaceful. "I am honoured and excited to start my tour of duty as the European Union's Head of Delegation to the Republic of Zimbabwe today," said Olkkonen. "Zimbabwe stands at a crucial juncture and I am looking forward for the country to take back its rightful place in the region, in Africa and in the world. "The EU has provided significant support to Zimbabwe since independence and will continue to do so as we develop our political, economic and trade relations. "The EU stands ready to assist and accompany Zimbabwe as the country moves forward to implement much needed political and economic reforms." President Emmerson Mnangagwa has indicated his willingness to pursue reforms as part of his pledge to re-engage the international community of nations after almost-two decades as a pariah under former President Robert Mugabe's isolationist policies. A citizen of Finland, Olkkonen is no stranger to the region, having served as Finish envoy to Zambia, Zimbabwe and Malawi, based in Lusaka from 2014-2018. Between 2001 and 2005, Olkkonen served as Second Secretary at the Finnish Embassy in Kenya. According to the EU, Olkkonen, holds a Master of Arts in General History from the University of Jyväskylä, Finland, and boasts an impressive repertoire of languages. Beyond his native Finnish, the envoy also speaks English, Swedish, German, French, Hungarian and basic Kiswahili. Olkkonen takes over from Philipe Van Damme whose tour of duty ended last month. Copyright © 2018 New Zimbabwe. All rights reserved. Distributed by AllAfrica Global Media (allAfrica.com). To contact the copyright holder directly for corrections — or for permission to republish or make other authorized use of this material, click here.